Marginally related question: why does every publication from Crown use the same font? Because it’s God’s inspired and perfect font for the English-speaking people. As long as they are cloth diapers. If cloth diapers were good enough Jesus, they’re good enough for me. Or is that the Quiverful movement? No, that’s the Diaper-full movement. FWIW I did use cloth diapers on all my kids, as I was concerned about landfills and the like. Actually I didn’t really mind (I did use a diaper service for second daughter), and it did save a good bit of money. I did keep a few Pampers as a backup, but I’d still recommend cloth to anybody willing to give it a go, I still think it’s better for the baby and the environment. When my daughter and her husband were expecting, they looked into it, and found that cloth and paper were comparable, at least in a carbon footprint sort of way. Disposables have the paper and plastic and manufacture on their side, but cloth has not just the cloth, but water (and subsequent sewer and water treatment), soaps, electricity to run the washing machines, etc, and if it’s a diaper service you have to include the transportation fuel, etc. Either way, dealing with a baby’s excreta is going to cost you. Had I not worked full-time with all my babies, I would have done cloth. Many of my mom-friends do. But out West, it’s for the environment, not for tradition. Panda, I know someone who used to do cloth diapers for her kids. One of the kids had a much worse diaper rash in cloth diapers compared to disposable ones. That’s funny, I put my little ones in cloth when they had horrible rashes so their poor little bums could get more air. Or they went naked in the summers. Can’t beat sunshine and fresh air for healing! My brother and his wife were determined to use only cloth diapers on their son, believing it’s better for the environment (which I believe, too). But the little shaver got a persistent diaper rash that wouldn’t go away until they switched to disposables. I’m no doctor, and I can’t explain why it happened that way, but that’s one anecdotal case there. Another option is to try the early training method, where you notice your baby’s cues and dangle the infant over the pot. Using a consistent font isn’t a bad idea, to establish a brand identity. And as far as fundy-chosen fonts go, that one isn’t horrible. What IS horrible is the use of the crown icon for a bullet. Yep! I worked as a secretary there. It’s the Goudy fonts. Haha. Frankly, some of these things are really good advice that apply in any context. The memorandum does contain some truth and useful advice e.g. pray for fellow employees by name, look after your own family, read your Bible, etc. 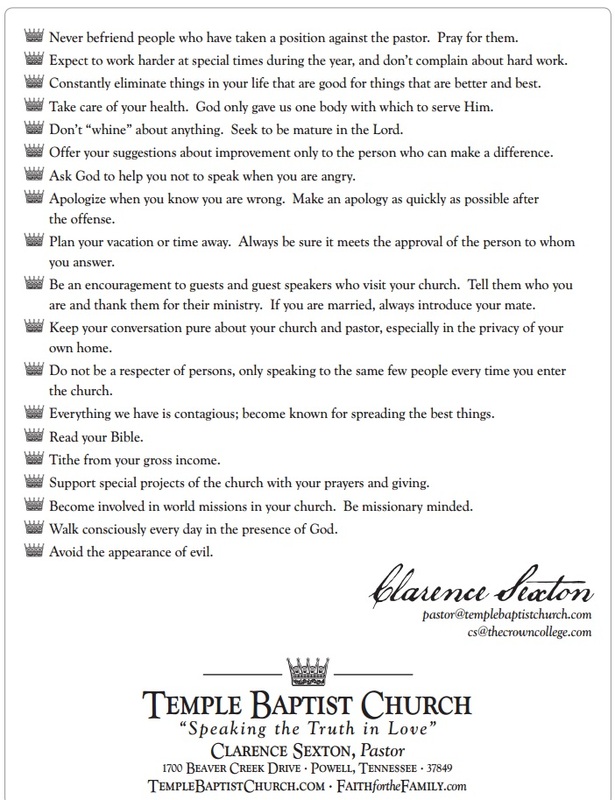 The thing is, one might expect that people who were judged to be faithful enough as well as spiritually mature enough to be entrusted with ministries at Temple Baptist Church would not only find these truths to be obvious, but would already be doing these things. Add to this the somewhat condescending tone with which the injunctions are presented, and this almost comes across as being comparable to telling adults to be sure to look other people in the eye when shaking hands with them, and to always wash their own hands before dinner and brush their teeth before going to bed. 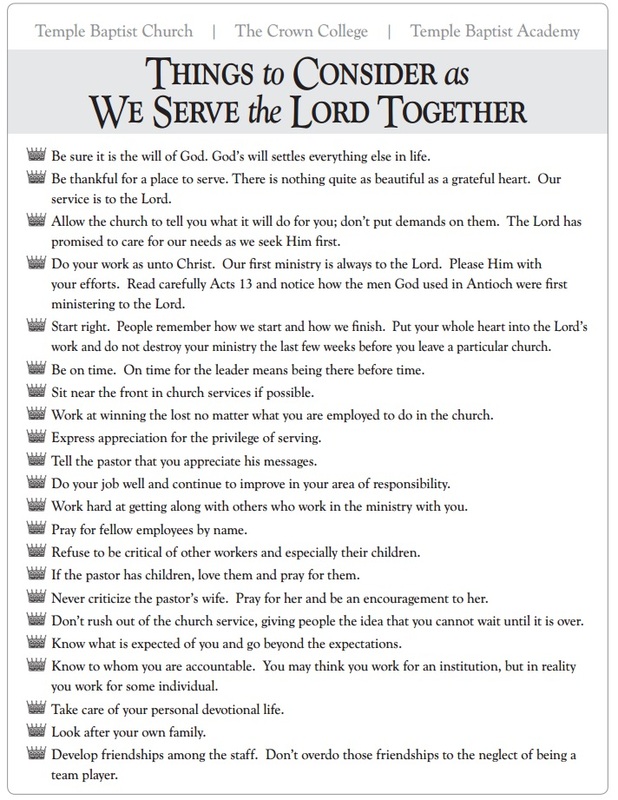 Of course the bigger problem here is the inclusion of such pearls as, “Allow the church to tell you what it will do for you; don’t put demands on them… “, “Tell the pastor you appreciate his messages,” “Know to whom you are accountable…” etc. Essentially, this, uh, missive is a self serving, egocentric, demeaning stew with a number of truths, most of which are beyond self evident, floating around in the broth. Also, I forgot to capitalize “Tell” in the previous corection. Who knows what errors that might lead to? Nah. It’s Bill Cosby’s mom. Here’s the thing: for me “go beyond expectations” and ” take care of your health ” are mutually exclusive. I’m now facing my fifth bout of mono in eight years. With my strict PCC training, illness proves a lack of godliness. Basically, if you’re sick, you’re useless. A lot of girls at HAC had Epstein-Barr Syndrome. So many of them worked so hard all the time that they got sick. I can believe that. I came down with fibromyalgia while I was in school- single parent carrying a full credit load in a difficult program. Never really recovered, either. I understand more than you know. I’ve seen the affects on my own wife under such circumstances. Duh! I should have thought about that first! Better to pre-select them first. Wait, preselect the random strangers? Okay. No, TieceyKaye. Pre-select the strangers. I’m not so good at selecting bedfellows. Maybe I should have the church choose for me. Both my kids have different dads. Different moms too, for that matter. Sometimes the results are great. I hope yours have been. Fundamentalism portrays itself as the ultimate answer to personal contentment and family happiness. Listening to their CDs of hymns (especially the highfalutin BJU music style) and you get messages of glory, grace, sins forgiven, complete victory and contentment in Christ. What is usually missing is the reality. Life is not so easy. Sins are not so quickly conquered. There are no trumpets and strings and upsweeps of glorious crescendo. The promised peaks of glory are unobtainable, and the valley of sorrows and shadows is where we often dwell. I am working hard to repair and strengthen my own relationships with my wife and children. It is often a few steps forward, then several back. Mine are getting there. I can tell you I’m not nearly so starry-eyed about foster care & adoption as I was when I started 10+ years ago. Tithe from your gross income. In other words, you know that pittance that we pay you…yeah…we want 10% of it back….as a matter of fact, we will withhold from your check automatically if you want to be REALLY blessed! Yes, an employer telling its own employees to tithe back to the employer is beyond presumptuous. I feel horrible, just horrible, I’m telling you. The light’s dim here and my eyes are bad and, swear to goodness, when I saw the second rule, I thought it said, “Be thankful for a place to scr*w. Within seconds, I was thinking of the Michigan woods and Crete, Indiana. Am I a reprobate? Is there any hope for me? No. You may have been thinking about Jack Trieber. Or Jack Schaap. But that would have been memos to self, not to the staff. That doesn’t mean the pastor here has a scandal in the offing. But then again, who knows? Oops. Apparently the wrong college. Crown College is in Michigan. The Crown College is in Tennessee. There’s also a Crown College in Minnesota, used to be affiliated with the CMA, again same name totally different. In other words, the man-o-god is saying, sure it’s all for Jesus but I own you b*tches!!!!!!!!!!!!!!!!! Really though, there fundyism in a nutshell. It’s “for Jesus” but in reality you are a slave to some man.